of the audiophile's commitment to musical enjoyment. TAK™ preserves all the precious detail that can be extracted from vinyl. 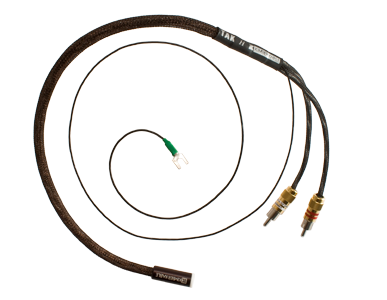 OCQ/2™ (Orthogonal GyroQuadratic/2 channel) braiding virtually eliminates electromagnetic interference, radio frequency interference and crosstalk. options are available on request. DUT: TAK H 1m terminated with Ultraplate RCA type connectors.